The Seedlings are Growing Up! Is there a name for a plant’s middle stage between being a little seedling and an adult plant? If there is, then that’s where we’re at with ours! Well, with the tomatoes, anyway. Should we use this space to complain about yet another snowstorm? Eh, at this point, it seems quiet redundant. But yes, along with everyone else, we survived our fourth Nor’Easter of March. And though this one dumped them most snowfall of all the storms this month, it really wasn’t that bad. Our local road crews did a good job of keeping the streets clear, and we really only had to shovel out once. Plus, warm temps that followed made quick work of the snow generally, though even now there are still a few stubborn piles here and there. An d this week, Mother Nature has changed her tune significantly towards a Spring-ier song! Warm and rainy is what’s promised…we’ll see how that all pans out. Meanwhile, there’s little else to report. Our new sump pump has been working like a champ, and we’ve had no further plumbing mishaps *knock on wood* since. 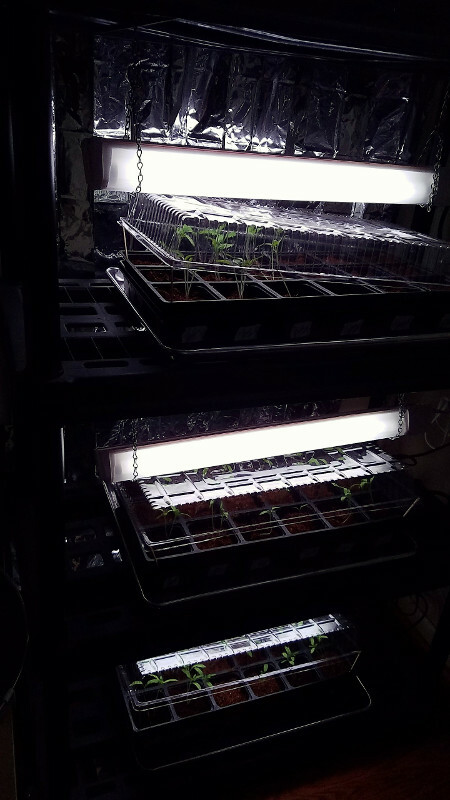 The seedlings are doing nicely, and we made a first pass at thinning out the tomatoes (more on that next week). As we head into Easter, it’s a good time for some quiet reflection anyway. And right now, we’ll take all the quiet we can get! 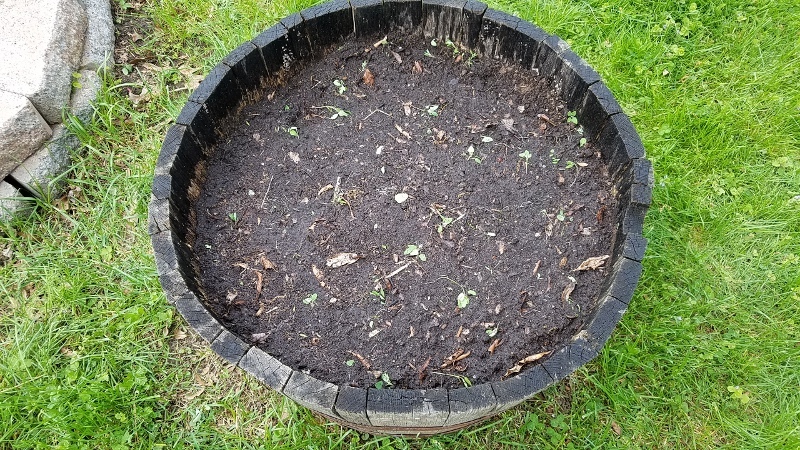 One of the strange and potentially funny side effects of having a gardening blog is that we’ve ended up with an inordinate amount of pictures of dirt. Granted, it is usually dirt that’s brimming with newly-planted seeds, but really, it’s still dirt. There’s nothing wrong with that – it does show the process and all — but it’s still a little bit odd. So how’s about that dirt?! Well first, how about the reason for taking pictures of said dirt? It’s because we got around to planting seeds, that’s why! This past weekend, we enjoyed a really lovely and warm Saturday. It was followed by a much cooler Sunday, and by the looks of the forecast, things are going to remain on the cooler side for a bit. 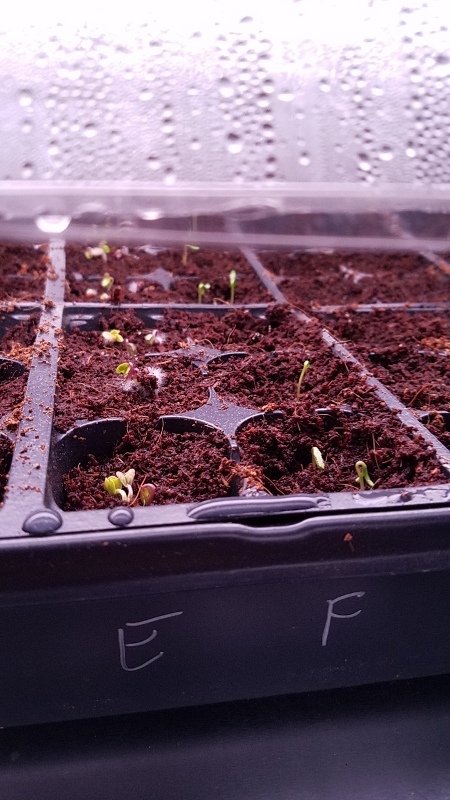 With that in mind, we knew we could plant seeds that could handle a slight dip in temps, such as lettuces, arugula, kale, spinach, and radishes. 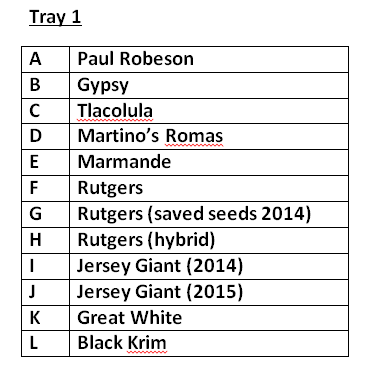 Planting prep tip #1: identify what you want to plant. Easy peasy! On something of a whim, we decided to include flowers and herbs, along with a few other surprises, because we now have a slightly different planting situation with two of the raised beds. Namely, we replaced the old, rotting boards with concrete blocks. This is the “new and improved” raised bed #4. And this is the “new and improved” raised bed #2. We can barely tell them apart, too. The reason for including other seeds in the mix — flowers and herbs and such — is because of all the surrounding planting “spaces” that we now have thanks to the concrete blocks. In those spaces we wanted to place a variety of items that might repel rabbits, or if the rabbits happen to get curious, at least distract them from what’s actually in each bed. As we’ve said before, the keyword with the garden this year is experiment. So, in raised bed #2 we placed two lettuce varieties, along with kale and spinach. 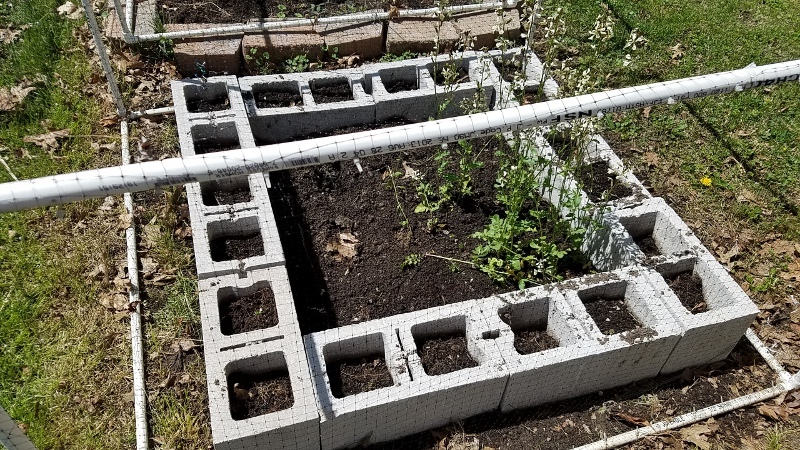 In the outer planting “blocks,” we planted various flowers and herbs — basil, thyme, dill, and cilantro — in an alternating pattern. In raised bed #4 are two types of arugula, along with two other types of lettuce. Around the edges of this raised bed, we got a little crazy and planted not only flowers and herbs, but also radishes, carrots, and even onions! While we seem to have the best of luck with radishes, the same can’t be said of either carrots or onions, but with the deeper plots, we decided, what the heck! We had the seeds already — the onions we hadn’t bothered with for a couple years — so why not see if they happen to take? Meanwhile, we also placed radish seeds in our two half-barrels. 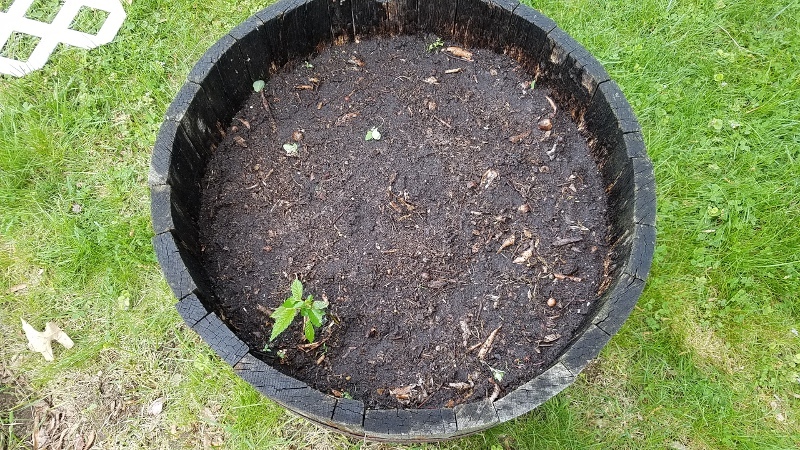 Barrel #1 with Saxa II and Round Black Spanish radishes. Barrel #2 with Malaga and White Hailstone radishes. …and an unknown volunteer plant that we were too curious about the get rid of. So there you have it. Pictures of lots of dirt. But hopefully it’s dirt that will soon be full of little seedlings! We’ll sign off here with two more pictures that we couldn’t resist taking. 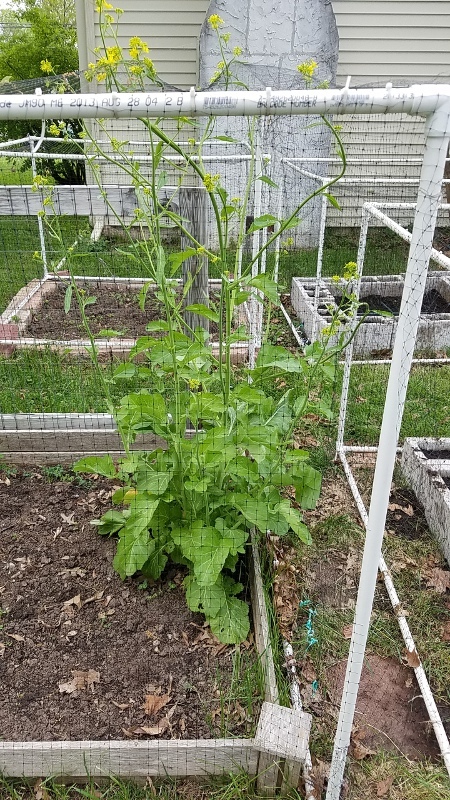 Remember the little volunteer broccoli bush from a couple weeks ago? Well, it’s gone perfectly gigantic! It is literally growing up and out of the net cage! We’re going to have to remove it when we redo this particular bed, which we use for peas and broccoli (haha), in concrete blocks, but for now, it’s pretty wild-looking. And it does have those nice, yellow flowers on it. 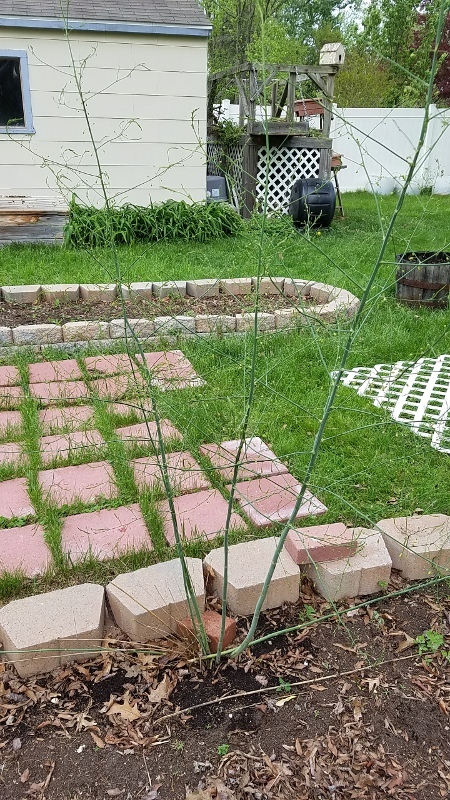 A similar thing happened to our asparagus stalks. Seemingly overnight, the stalks grew into small trees! Our previous attempts at asparagus have also gone to seed, but not quite like this! What’s going in the garden this year? Good question! Around this time each season, we’ve worked on preparing our planting maps. 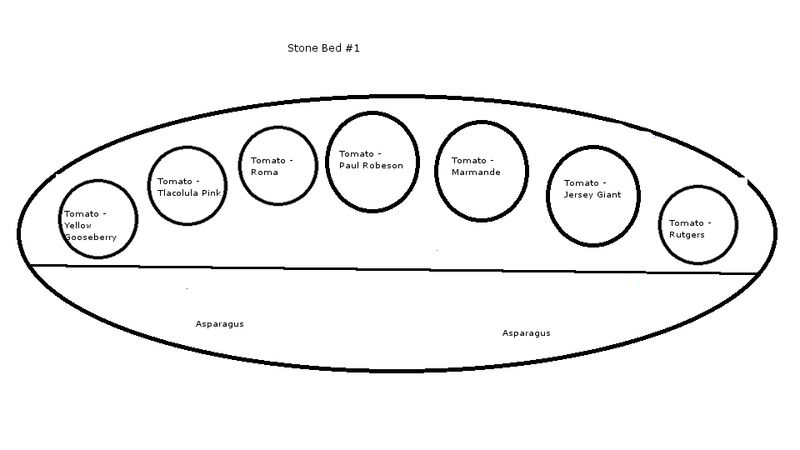 Using, umm…highly sophisticated drawing software (read: MS Paint), we outline our planting beds and decide where to put everything from beans to kale to tomatoes. Just one example from last year. See, highly sophisticated graphics and all. Well, this year, we’re doing things differently. For one, we’re skipping the planting maps. Well…we’re skipping preparing them in advance, anyway. Driving this is the seedlings. We have so many potential tomatoes and peppers that we want to plant them all! So, outside of the beds where we’ve been planting beans, cucumbers, peas, squash, and greens — those will remain — we’re going to transplant all the peppers and tomatoes first, in all available spaces, and then we’re going to fill in any extra spaces with other crops. At that point, we’ll fill in our planting maps just to keep track of what’s been planted where. Because of this, secondarily, the garden may be a little less diverse than it has been in past years. We’ll likely skip planting a number of things that have been hit-or-miss, such as okra, soybeans, brussel sprouts, broccoli, and possibly ground cherries and radishes. But we’ll see how things go. 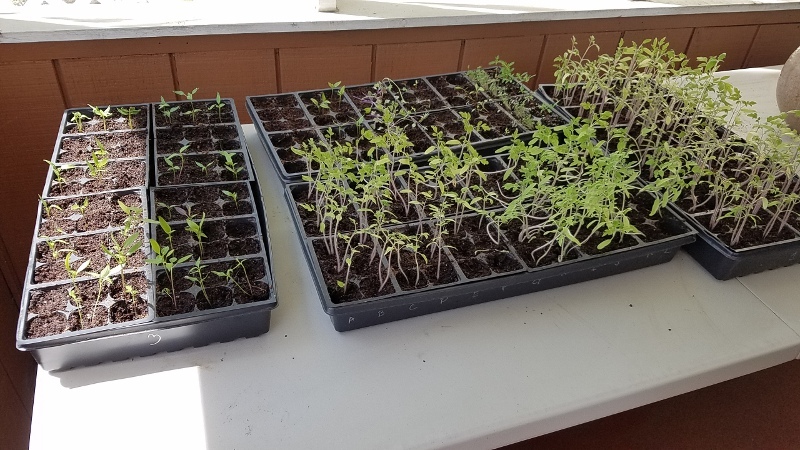 A lot will depend on how well the pepper and tomato seedlings take. 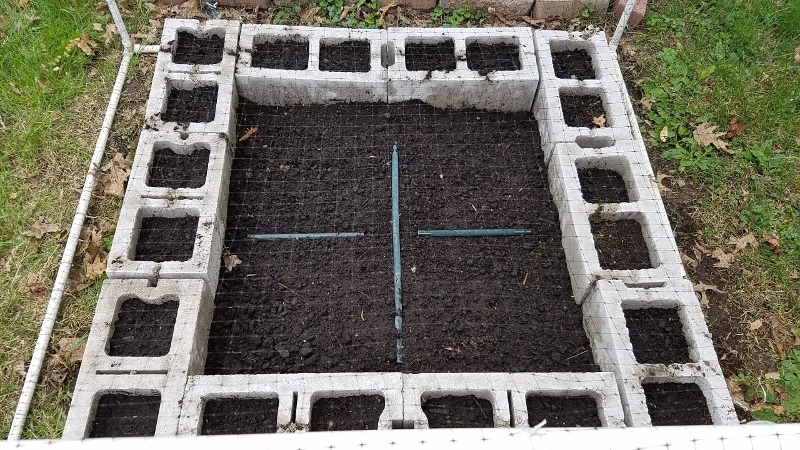 Now, because we’re replacing the wood raised beds with concrete blocks, we’re hoping to take advantage of the spaces within the blocks themselves to try planting a few underground items in them, such as carrots and radishes, that need the extra length. While the aesthetics might leave something to be desired, the practicality is where it’s at. 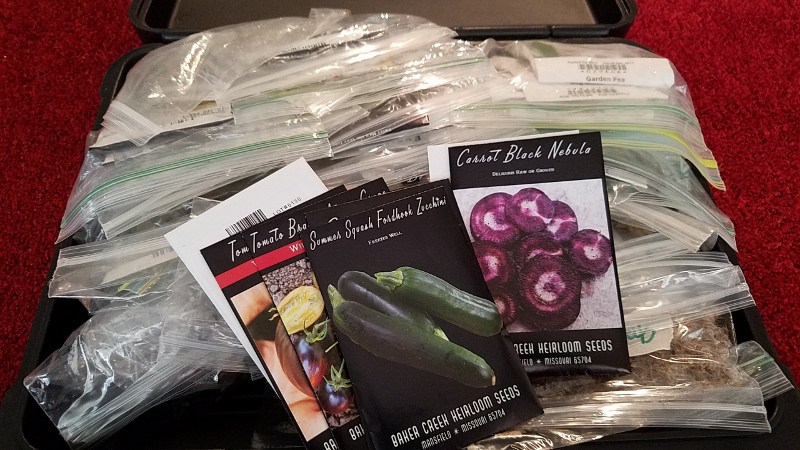 So what’s going in the garden this year will be mostly tomatoes and peppers, along with our usual complement of bush beans, pole beans, cucumbers, various squash, greens and lettuces. Additionally, we’ll be planting a variety of flowers as rabbit-proofing, as well as a few surprises. It should all be very interesting, at least. 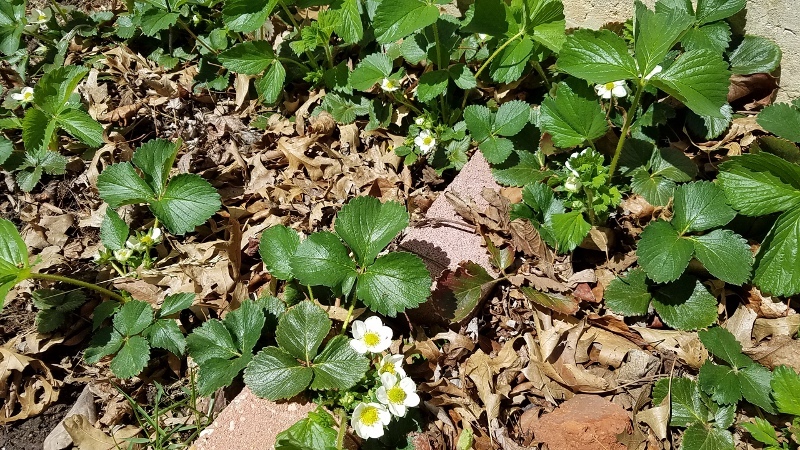 We sign off with our lovely strawberries, which just started blooming. June can’t come soon enough! Time to Start the Seeds! You know how they say “time to make the donuts?” Well, this is just like that except that it’s time for us to make new plants, instead! 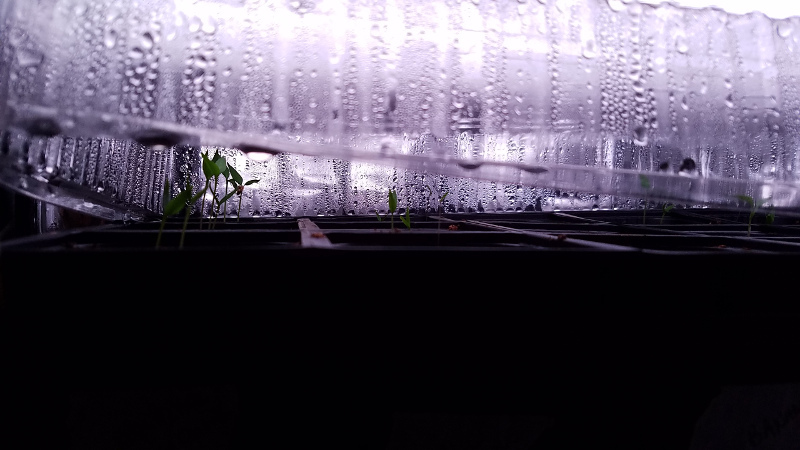 Yep, our efforts to get on a good schedule with our seedlings began this past weekend. 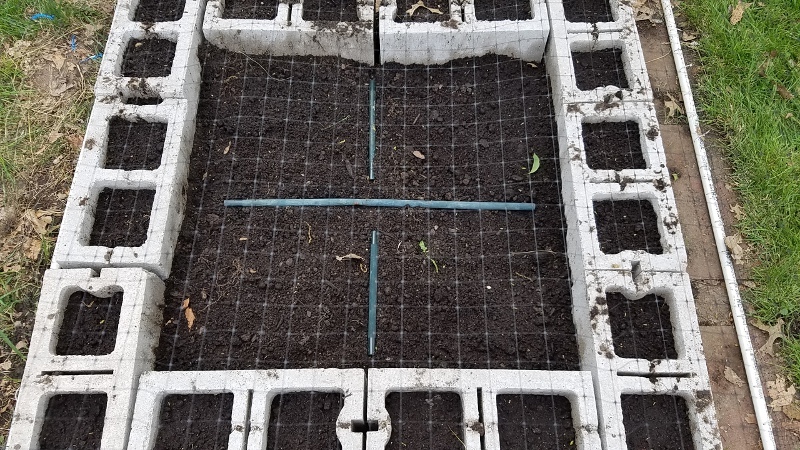 We got all four trays planted and incubated without issue. 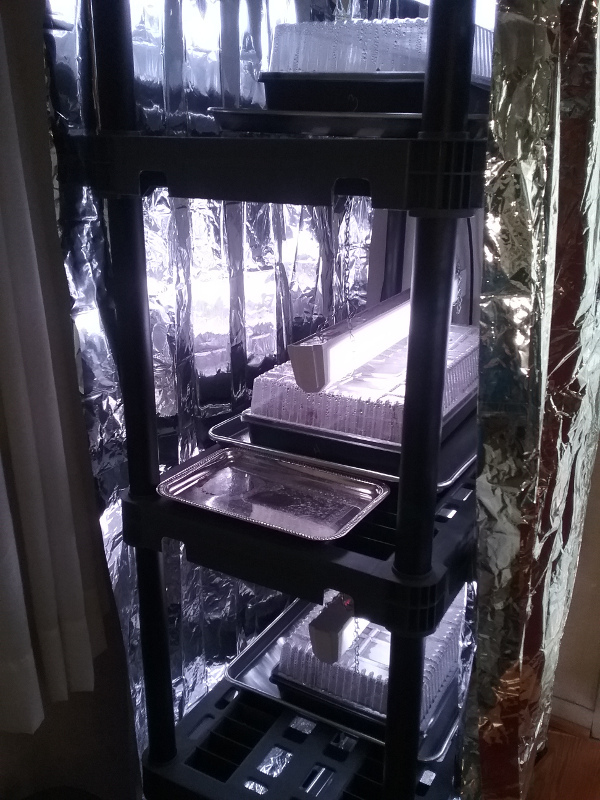 As we said a few posts ago, this year we’re going to endeavor to not “cook” our poor seedlings; rather, we’re only keeping them shielding by a sheet of mylar on the front of the shelving unit until the seeds start to germinate. (The mylar on the back of the unit will stay as it helps aid in reflecting the light.) Once the seedlings start to grow, we’ll remove the front sheet and simply keep them warm, when needed, using one of our portable heaters. 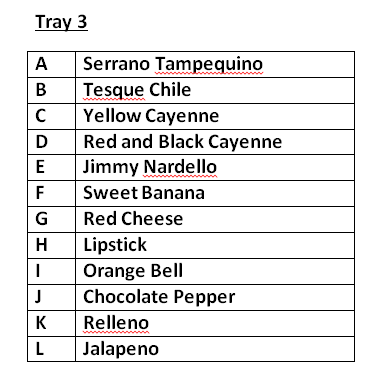 …while we placed smaller varieties, such as cherry and grape tomatoes, in Tray 2. 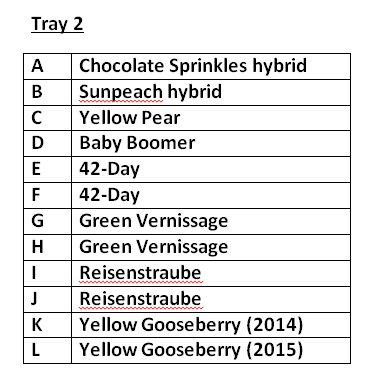 Any dated notations in each tray refer to saved seeds and the years in which we saved them. 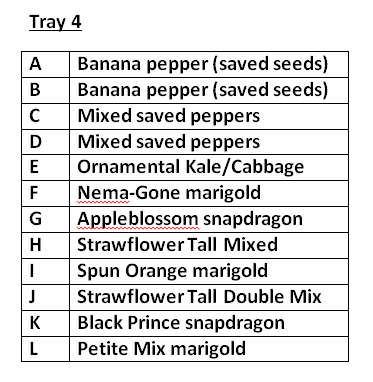 And then in Tray 4, we planted a couple more rows of pepper seeds, and then filled up the rest of the rows with this year’s experiment: starting flowers indoors! While we’ll be planting flower seeds directly come May, we wanted to see if we could give any a head start with indoor planting. You might not believe it (we sure didn’t! ), but here, just a few days after planting the seeds, some of the Ornamental greens and Nema-Gone marigold seedlings are already coming up! It’s rather amazing! We’ll be keeping a close eye on things here in the first couple weeks. Then, once more seedlings starts to emerge in earnest, we’ll be doing even more babysitting to ensure that they grow strong and hardy. Seed starting is always a lot of work and worry, but hopefully it’ll all pay off in 6-8 weeks time. © 2013-2019 Garden State-ments. All rights reserved.